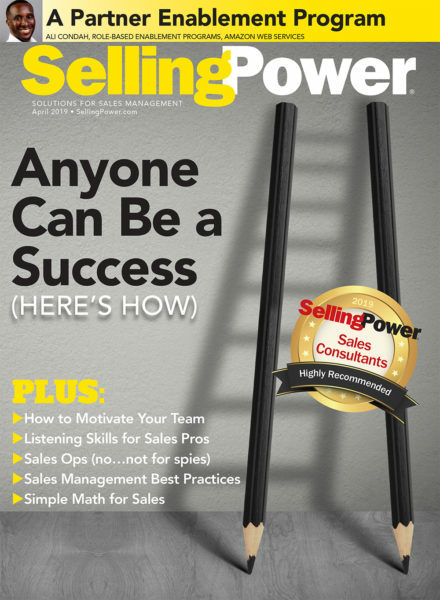 Every year, Selling Power magazine’s research team ranks companies according to the estimated number of salespeople they employ. The 500 top companies in America, which employ the world’s largest sales forces, depend on millions of salespeople to achieve their revenue goals, and the number of salespeople this year is just under 25 million. This shows that, without question, the men and women who make up each company’s sales force produce the revenue that will continue to fuel this country’s economy. The 2017 SP 500 includes the top 200 companies in the manufacturing industry, the top 200 companies in the service industry, the top 50 insurance companies, the 30 largest direct-selling companies, and the top 20 automotive-dealer organizations (megadealers). Every year, new companies make the list while others drop off. The total number of salespeople employed by all 500 companies listed is 24,929,421, which represents a sizable decrease of about 4 percent – or more than 1 million fewer salespeople – from last year. This overall change is due almost entirely to a decrease in the number of salespeople working for direct-selling companies. The direct-selling category, which posted a significant 4 percent increase in 2016, posted an equally significant 4 percent decrease this year – a possible indication that people are returning to the more traditional full-time sales force in greater numbers or joining some other areas of the workforce. The number of salespeople in the manufacturing industry increased by more than 1 percent, while the number of salespeople in both the service and insurance industries declined in 2017 – by 1 percent and 6 percent, respectively. The decline in the service industry continues the trend in declining sales-force numbers posted for the most recent two years. The automotive industry posted a small increase in the number of salespeople: up just over 1 percent. Overall, without the direct-selling numbers, the number of salespeople decreased for the first time in two years, by 38,856 salespeople. The states with the most SP 500 companies are California (55), New York (51), and Illinois (37). The states in which the SP 500 companies employ the largest number of salespeople are New York (6,693,175), California (5,033,159), and Texas (3,639,072). These states account for about 28 percent of the total companies and a whopping 61 percent of the total salespeople. Our research team continued to find that salespeople employed by manufacturing firms contribute a far higher amount of sales revenue than other industry segments. The top 200 manufacturing firms employ 528,030 salespeople and produce more than $4.1 trillion in sales. That’s an average of more than $7.8 million in sales per salesperson. This represents a significant (6 percent) increase in productivity compared to the previous year, which means productivity – which had been stagnant or declining for four consecutive years – is now beginning to rebound. The number of manufacturing salespeople increased, gaining almost 7,000 salespeople since last year. The total number of manufacturing industry employees also increased this year, increasing by more than 3.5 percent over last year. The top 200 companies in the service sector reported a small decrease of almost 8,000 salespeople, bringing the total to 592,284 salespeople. The number of salespeople decreased by just over 1 percent, and the total revenue came in at more than $3.4 trillion – an almost 10 percent increase over last year. This represents more than $5.7 million in sales per salesperson and a healthy 11 percent increase in productivity – now showing three straight years of productivity gains. The number of service-sector employees increased by a significant 15 percent this year, making it an impressive five consecutive years of increases in the number of service-sector employees. 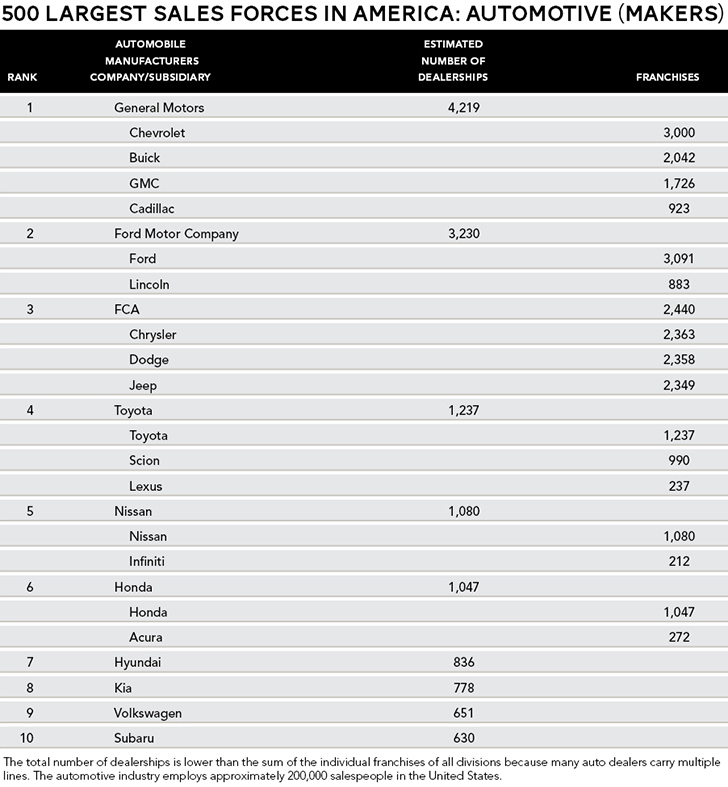 The top 20 automotive megadealers reported mixed numbers this year. 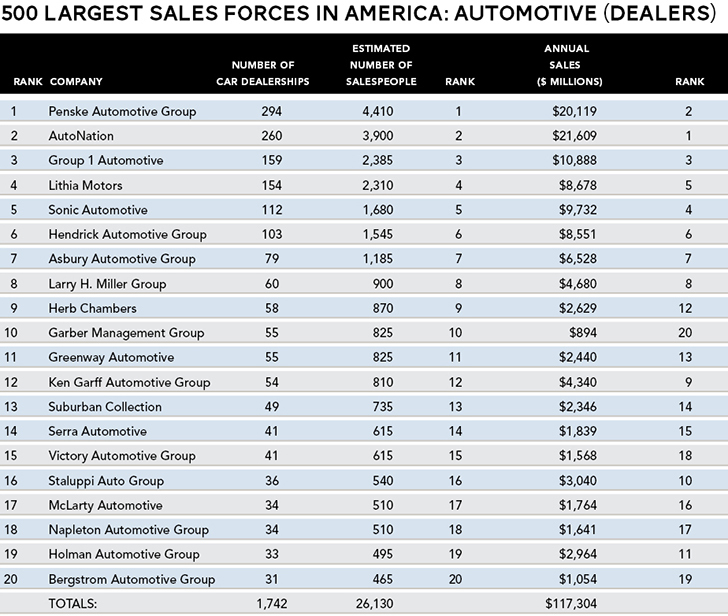 The top 20 firms own 1,742 dealerships (up by about 1 percent), employ an estimated 26,130 salespeople (an increase of about 1 percent), and produce more than $117 billion in sales (down by more than 3 percent). This brings the average annual sales per salesperson to almost $4.5 million (down by more than 4 percent). The productivity registered shows a sluggish automotive industry still in the process of recovery. 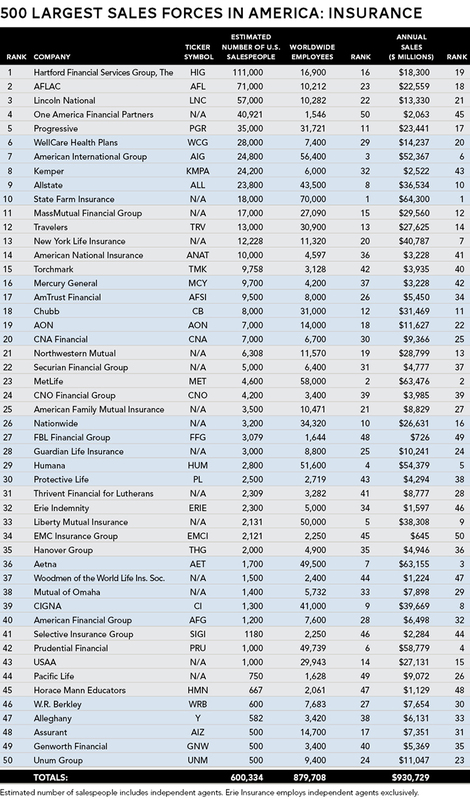 The top 50 insurance companies employ sales forces totaling 600,334 across the industry, with an average sales volume per salesperson of $1,550,352. This represents a large increase in productivity of more than 36 percent. In fact, the number of salespeople declined slightly from last year (a 6 percent drop), while their productivity increased significantly. The total number of employees posted a significant increase of more than 18 percent over 2016. The top 30 direct-selling companies reported more than 23 million salespeople, reversing a trend of increases in the number of salespeople in this industry within the past 16 years. This year’s sizable decrease in the number of salespeople marks the industry’s first significant decline in the past six years. It is interesting to note that, while overall employment numbers showed positive increases across the board, the sales-force sizes across all industries were relatively unchanged or in decline. Productivity, per salesperson, increased this year across all industries, with the exception of the automotive industry. Productivity per employee increased this year across all industries except in the service industry, which posted a 5 percent decrease from 2016. Overall, 2017 showed a generally positive employment environment, increases in productivity, but a stagnant sales force in terms of the number of salespeople. Each salesperson in the service or manufacturing industry supports, on average, 15.08 other jobs within the company; that figure marks a significant increase over last year’s number of 13.71 and more than compensates for last year’s small decrease. These companies employ a total sales force of more than 1.1 million salespeople, who produce more than $7.5 trillion in sales and ensure the employment of almost 17 million people. This underscores the fact that the sales forces of America are responsible for helping sustain and ensure our economy’s future growth. 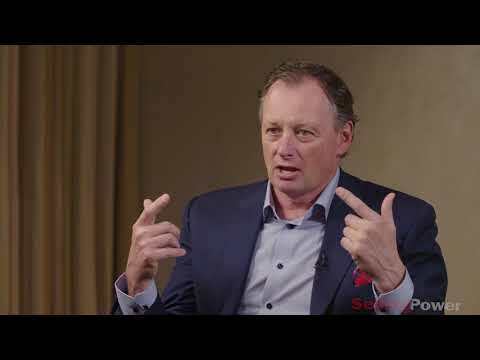 TOP EXECUTIVES – Use the SP 500 to benchmark your company’s productivity per salesperson. Find out how you measure up to your competition and the average in your industry. Check which companies have decreased their sales forces and which are gearing up for expansion. SALESPEOPLE – Use the SP 500 as your best-prospect list. There is no other source that gives you access to those companies that purchase products for a large number of salespeople. This is your ideal list if you sell sales training, sales-incentive services, customer relationship management solutions, automotive fleets, sales meetings, or trade show services. Begin your account planning by researching company Websites. JOB SEEKERS – Use the SP 500 to plan your sales career. 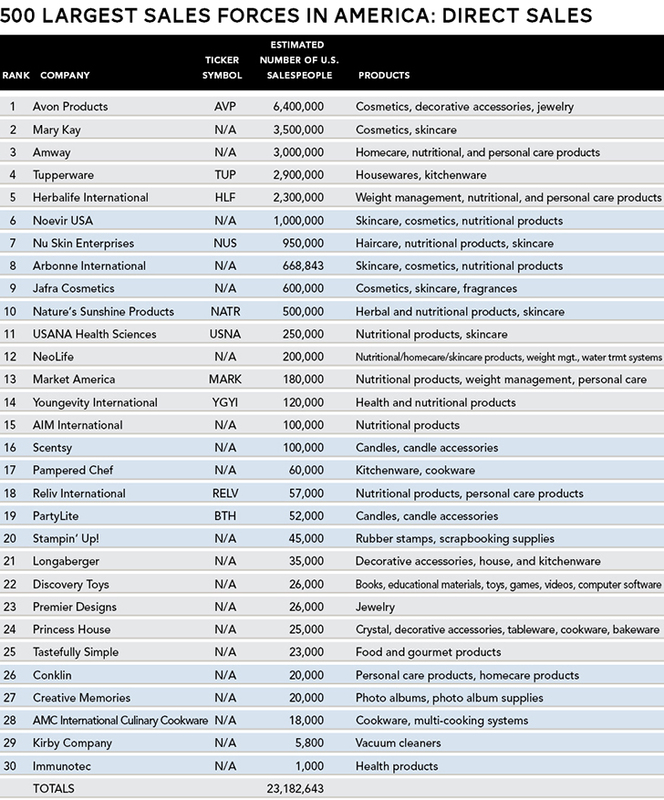 These 500 companies employ the largest sales forces in America. Large companies invest heavily in recruiting, training, and rewarding sales staff. To find job openings, log onto the companies’ Websites. Special thanks go to our corporate research team for collecting the data. 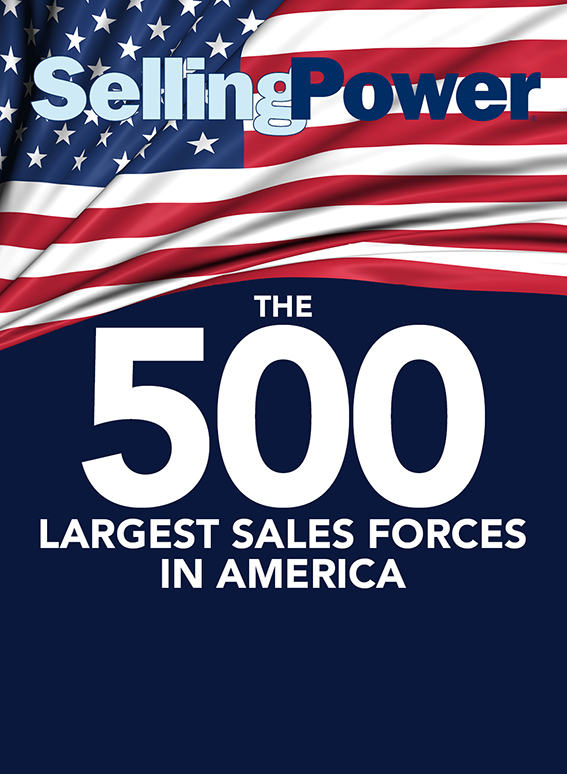 To have your company listed in the Selling Power 500 next year, please write to SP 500 Research, PO Box 5467, Fredericksburg, VA 22403.